For the 24 hours to 23:00 GMT, the USD declined 0.36% against the CAD and closed at 1.2513. The Canadian Dollar gained ground against the USD, after Canada’s Markit manufacturing PMI climbed to a level of 54.7 in December, notching to a three-month high level, thus suggesting that manufacturers ended the fourth quarter on a strong footing. The PMI had registered a level of 54.4 in the prior month. In the Asian session, at GMT0400, the pair is trading at 1.2521, with the USD trading 0.06% higher against the CAD from yesterday’s close. 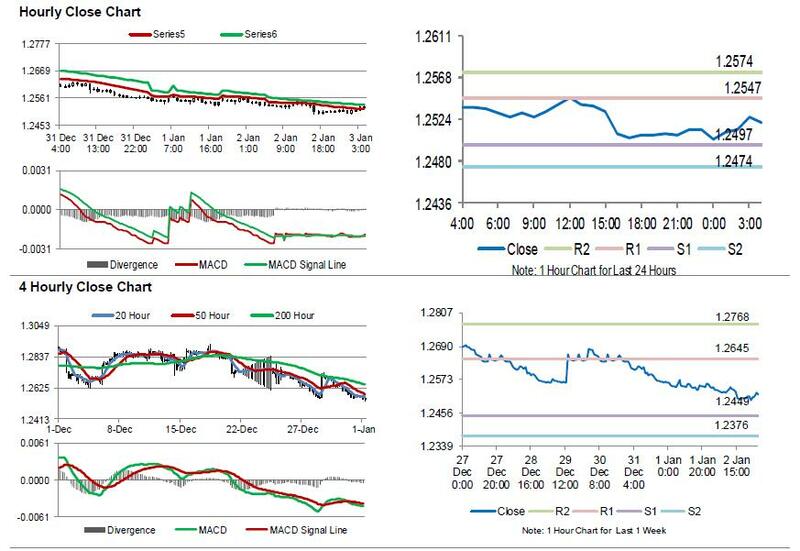 The pair is expected to find support at 1.2497, and a fall through could take it to the next support level of 1.2474. The pair is expected to find its first resistance at 1.2547, and a rise through could take it to the next resistance level of 1.2574.